Kevin McHale is one of those actors whose show business career received a boost, thanks to their part on the FOX musical drama, Glee. McHale played the role of Artie Abrams and as part of the cast, won the 2010 SAG Award for Outstanding Performance by an Ensemble in a Comedy Series. Post-Glee, Kevin McHale has been very successful as a TV and radio personality. From 2014 to 2016, he served as the host of British panel show Virtually Famous. He is one of the hosts of Sick of My Own Voice, a radio show that airs on Dash Radio. Here is a look at some key facts about him as well as his sexuality. To answer that quickly, Kevin McHale is gay. His sexuality has been some sort of an open secret to his fans until a tweet he made in May 2018 in reference to the Ariana Grande song “No Tears Left To Cry” unintentionally made it very official. Grande herself would later come out as bisexual in her music video for Thank You, Next, that would be released months later. Post-Glee, McHale began giving hints regarding his sexuality. One example was in 2016 when he was part of the Human Rights Campaign tribute video to the victims of the 2016 Orlando gay nightclub shooting. As months passed, his actions on social media and continuous support of the LGBTQ community provided more concrete facts about his homosexuality. Speculations went a notch higher after he posted a photo of himself cuddling up next to actor Austin McKenzie with a caption that read #mycoachella. The development got him on a Live Facebook chat with Marc Malkin who got him to speak more on the topic of his sexuality. In his talk with Malkin, McHale expressed his surprise at the immediate congratulations he began receiving after making the post. He added that though he didn’t shout his sexuality on the mountaintops, his loyal fans should have already known that he was gay, judging from the posts he’d been making on his social media. When asked why he didn’t come out during his days on Glee, Kevin McHale said it was in respect to his then-partner who didn’t want someone in his family to be aware of his sexuality. McHale also went on to reveal that he and actor Austin McKenzie began dating since 2017. Read Also: Grant Gustin Biography, Age, Height, Net Worth, Wife, Is He Gay? The gay couple met on the set of When We Rise, an 8-part series about LGBTQ rights and soon kicked things off. Kevin McHale played the role of Bobbi Campbell, an AIDS activist. McKenzie is perhaps best recognized for playing Melchior Gabor in Deaf West’s revival of Spring Awakening. 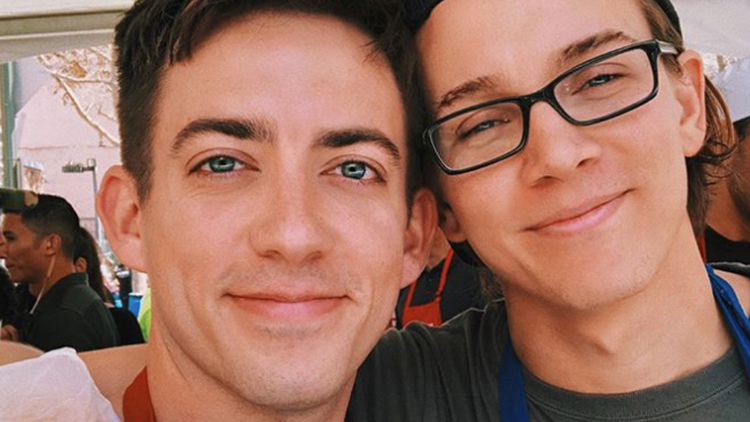 Since coming out, Kevin McHale has been more open about what goes on in his relationship with McKenzie. In one post, he referred to him as his “man”. The post was about the gift that McKenzie made for him for his birthday on June 14th. The gift (photo of which he posted) was a three-tier cake comprising of all of McHale’s favourite things – Oreo, banana cream pie cake, and cornbread with BBQ chicken. • Kevin McHale was part of a boyband named NLT – “Not Like Them” before joining the Glee cast. • He was childhood friends with Demi Lovato with whom he co-hosted the 2012 Teen Choice Awards. • His ethnicity can be traced to County Mayo, Ireland. • Kevin McHale stands at a height of 1.73 m tall. • He has a net worth estimated at $10 million. A figure that affords him a $1 million mid-century home in Hollywood Hills. • Kevin McHale shares the same name with an American basketball coach Kevin McHale who played 13 seasons (his entire career) with the NBA’s Boston Celtics before coaching for 10 years between 2005 and 2015. • Kevin McHale transformed his body from skinny fat to an athletic hunk in order to solve an unbearable stomach issue.